Ingmar Bergman’s intimate saga of a marriage gone bad stars Liv Ullmann and Erland Josephson. The question is raised by a character in Ingmar Bergman’s Scenes From a Marriage (1973), a five-hour, six-part miniseries made for Swedish television that was subsequently shortened to a mere three hours for an international theatrical release. Though far more limited in scope and production value, not to mention a pronounced shift away from the existential questioning that drove so much of Bergman’s filmmaking career up to this point, Scenes is nonetheless a fine joiner into the filmmaker’s canon; crucial, in fact. Which is what makes the following admission all the more pained. ... Despite a professed adoration of the cinema of Ingmar Bergman for well over a decade, this critic must confess that Scenes From a Marriage has been an unable commitment -- until now. On my list of Bergman titles seen, a not insignificant number, Scenes From a Marriage ranks as the most rawly actor-centric of the bunch. That's truly saying something; Bergman harbored a fundamental love of actors, a passion that more than effectively fed into his meteoric rise in the global film scene several decades earlier. Star players of Bergman’s personal “stock company,” Liv Ullmann and Erland Josephson, share the screen for the bulk of this dramatic work, no doubt one of the most formidable two-handers in cinema history. Playing Marianne and Johan, a quaint, upperly mobile married couple, Ullmann and Josephson, under the expert direction of Bergman, deliver a solid five hours of tour-de-force performance. In the beginning, Marianne, 35, and Johan, 42, in their tired contentment, are actually convinced of their own conjugal happiness. But eventually, there’s a realization that amid secret affairs and going through the motions, that they’ve been slowly draining the life from one another all along. Despite things boiling to the surface, they remain in imperfect synch with one another, even as (particularly as) their characters’ union abruptly breaks, then proceeds to consciously, methodically erode. From there, the on-screen relationship can’t help but dance together one more time. Years pass. Then again, one more time. More years. One more time. As Ullmann, who had only recently broken up with Bergman at the outset of Scenes’ production, points out in the great new documentary Searching for Ingmar Bergman, the director always lamented his lack of acclaim as a writer. His teleplay for Scenes from a Marriage is a major example, as his measured beats of mundane life, moribund passion and melancholy drift effortlessly build up and give way to cycles explosive confrontation and palpable repression. Pain, longing, pity and yes, love, strain from every corner, every broadening crack, of the terse yet confined years-spanning intimate saga. It’s all the more impressive, then, that the project came to fruition on a comparative shoestring. Following 1971’s lavish Cries and Whispers’, Bergman’s production company was left in a financial tight spot. Whatever his next project would be, it would not be rendered on the opulent scale of that film. The decision was made to forego cinema completely, and go straight to television. Scenes From a Marriage was shot on 16mm film on the director’s home island Fårö and in Stockholm for very little in the way of budget or resources. What the film does have going for it, though, more than makes up for any such deficiencies. Bergman’s ace cinematographer Sven Nykvist is once again on hand to render the image via light and shadow, though don’t look for his trademark visual flair here. Nykvist dials back his approach not only accordingly, but per his established standards, jarringly. The lighting and veneer are almost abrasively flat, non-expressive. The order of the day is tight shots of characters in tighter situations. And it works. There’s almost a frustration in admitting that, as there is an initial disappointment in seeing Sven Nykvist’s name on a Bergman project, only to be met with such utilitarian work. It is the difference between visual restraint (say, his later work on Woody Allen’s Crime and Misdemeanors or even Nora Ephron’s Sleepless in Seattle) and visual practicality. Yet, as always, the artistic key is in striking the proper narrative motivation within the confines of the production. Nykvist was wise enough to cast aside his ego and simply give this project the televisual blah treatment that the characters' relationship reflects. Scenes From a Marriage might just be a case study in making a lot from a little. Ironic then, that Ullmann, in her bonus interview on the Criterion disc, recounts how Nykvist and Josephson became millionaires thanks to the backend deals they accepted in exchange for their work on the quick and dirty production. Ullmann herself laughs off her own decision to accept the alternative offer of a tiny salary, as she understandably assumed that an emotionally heavy small-scale Swedish television talkfest would never turn a profit. As things worked out, not only was the miniseries something of an appointment viewing phenomenon, but it proved to be a foreign language hit elsewhere in the world, including lucrative North America. As Criterion has finally upgraded Scenes From a Marriage to high definition, it must be noted that in terms of extras and artwork, the release is a straight port of their 2004 DVD, sans that set’s brick-like three-disc heft. 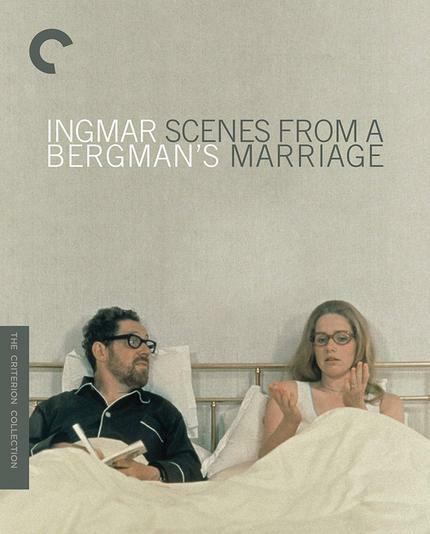 There’s a 1986 video interview with Bergman, terrifically forthright 2004 interviews with Liv Ullmann, the since-departed Josephson, and historian Peter Cowie, who gives detailed comparison between the two versions. The 2004 printed essay by the great author Phillip Lopate also re-appears as part of the Blu-ray release. With expert handling of the 16mm grain and image, as well as solid subtitling, Criterion’s two-disc Blu-ray affair is perfect for those looking to own this work of late-career resurgence, but have opted to pass on the upcoming massive Ingmar Bergman career retrospective box set, in which both cuts of Scenes From a Marriage will be included. The set, dubbed Ingmar Bergman’s Cinema, is set to drop with a satisfying thud on November 20, 2018. Criterion’s longtime go-to Bergman expert, historian Peter Cowie, in his interview, recommends first approaching Scenes From a Marriage in its initially intended form, as a miniseries; one one-hour installment viewed per evening. I will unhesitatingly concur, although if such a commitment is too daunting, the shortened theatrical version (paired down by Bergman himself) is a perfectly apt work; most certainly better than nothing. Amid my perhaps anticipated lauding of this film and Criterion’s Blu-ray release, it is entirely fair to bring up the glaring, if also fascinating negatives. Top among them is how Bergman’s own myopic inability to foster a successful marriage for most of his own life can’t help but inform the material. Even as his artistic admissions of his guilt deliver the intended power and resonance, there’s no denying a certain underlying woe-is-me handwringing. Worse still, his documented disinterest in his own kids (and there were many), plays out in the troubling non-presence of Marianne and Johan’s daughters. Their two girls are spoken of from time to time, but never shown, except for a moment in the very beginning when they are unceremoniously whisked off screen. They are fleeting ghosts in the forgettable periphery; obligatory elements within the kind of terminally average marriage Bergman was interested in exploring. Any legitimate parent would be quick to recognize this failing aspect of Scenes From a Marriage as grossly inauthentic, and spot the filmmaker’s own frightening disconnect from the very notion of fatherhood. Bergman was self-flagellating enough to call himself out as a soul-sucking soulmate. But there’s a line of demarcation when it comes to his attempts to communicate parental love, or even life with kids in the house. Do Marianne and Johan truly hate each other? Being that Scenes From a Marriage not only breaks form thematically and aesthetically for Bergman, but also in terms of ending on a note resembling optimism, the answer must be “no.” What’s terrifying is that they can never bring themselves to hate each, but can’t abide one another either. They cannot live with, nor without one another; they are simply stuck. They can break off, call it quits, and even physically assault each other. (And they do all of that). But this love, like a vampire, never dies.